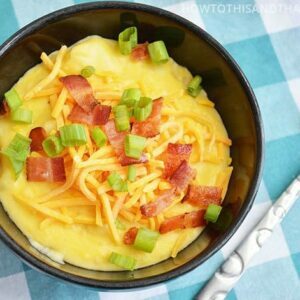 This thick, creamy, hearty and delicious loaded cauliflower soup is the perfect keto dinner for weeknights. You'll be reaching for seconds in a matter of minutes! Add the chicken broth, cheddar cheese soup, cauliflower, onion, garlic, salt and pepper to your slow cooker or instant pot on the sc setting. Stir well to combine. Cook on low for approximately 4-6 hours or 3 hours on high. 30 minutes prior to finishing, use a masher to break up the cauliflower. In a medium saucepan, melt the butter and slowly whisk in the xanthan gum and cream. Cook on medium heat, making sure to stir frequently until mixture begins to thicken. Add the mixture to the slow cooker or instant pot and then stir in the sour cream, 1 cup of cheese, and half the bacon. Stir occasionally within the last 30 minutes of cooking. Serve warm and top with additional shredded cheese, bacon, and green onions. Enjoy!